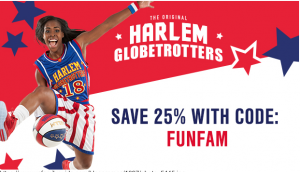 Warm Up with Winter Fun with the Harlem Globetrotters! This code is good for ALL games this season! Go get your tickets and have some fun with the whole family! I’ll be sharing my review of this year’s antics after we attend the game Monday! Tis the season for holiday gift giving, and if your kids are anything like mine, their list is short but expensive. They’d like gadgets and electronics not much else. And while some years we do give them something electronic, most years we go with making memories and providing opportunities. Our friends at Goldfish have the same idea – why not give the gift of experience, but also throw in some fun water themed items as well? 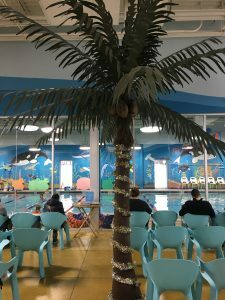 This year’s Goldfish Swim School holiday packages are fun to open and filled with goodies like two months of group swim lessons, 4 family swim passes, Goldfish goggles, Bubbles bath toy, Goldfish tote and the new and FIRST-EVER Goldfish story book, “The Fish Who Wouldn’t Swim.” The packages start at $168 for current members ($243 value) and $193 for new members ($268 value), and they can be purchased at Goldfish Swim School Fishers or Goldfish Swim School Carmel — while supplies last and they sell out fast! This year I’ve partnered with Goldfish Swim School to giveaway a gift package that’s sure to thrill your little fish or the child who wishes to become a fish! To win the package of what’s listed above, just enter the giveaway below. Note: This package is good the local Goldfish Swim Schools in Fishers and Carmel Indiana ONLY; winner may pick up at either location. 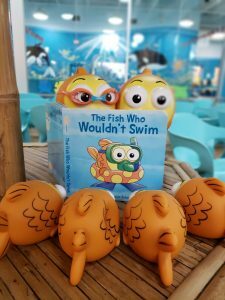 Thanks for reading and keep on swimming!